Feeling overwhelmed by acronyms? Or are they getting easier for you too? PLT’s within our PLC work together in order to commonly assess using the CCSS. Thanksgiving is past and as we head rapidly towards the end of first semester, I’ve got a handle on what that sentence means. How about you? The CCSS make sense – all students, all teachers, all states using the same language with which to teach and assess academic performance. SACI has become the acronym for the metacognitive step in my own lesson planning. The more I use it, the easier it becomes to understand exactly what skills my students don’t have, yet must acquire in order to grow intellectually. Core4All post on August 27, 2011: “It’s a process, not a program. When thinking about how to improve student learning follow this simple process. Decide what steps need to be put into place to achieve that result. The SACI template encourages me through its structure to easily connect my instruction to achievement. First: T-Chart analysis is done on a CCSS. Second: skills from T-chart are matched to Bloom’s taxonomy. Fourth: choose and write an assessment – like a quick, student friendly 4-point rubric. Here is a simple yet effective way to handle text, with students “DOING” the work daily. The bonus is by the end of the unit I have a formative assessment for all students in my class written within my text – chapter by chapter, and symbols for student participation/knowledge on a 4 pt. rubric. 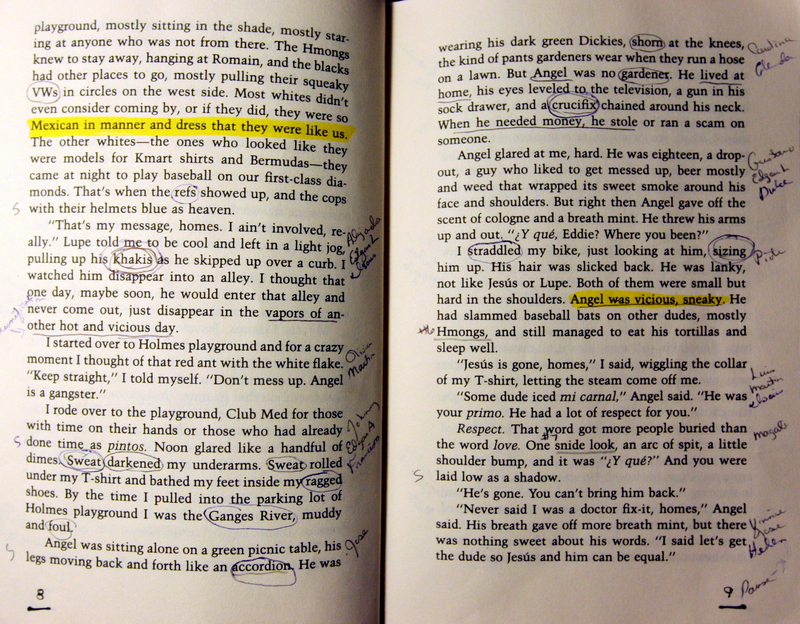 First: I annotate my own text by developing questions, writing them in the margin. Then using my “flow” style of reading we delve into our text – fiction or nonfiction – “flow” works well. I ask students to voluntarily jump in and read aloud as quickly as they are able, reading at most a paragraph sized portion, then giving up the floor to another voice. My current rule is “6 voices read between your voice and you reading again”. This rule allows most everyone to feel they had the opportunity to jump in and read. A bonus for “DOING” is an extra credit point per paragraph read. Once students practice and get the hang of just jumping in to read aloud, no name calling by the teacher, no interruptions accept “questioning”, the chapter flies. My rubric (see chart) – is a simple class list in a text box of three columns in which I mark correctly or incorrectly answered questions. I ensure all students are called on by using a homemade card deck -index cards with student names – from which I randomly draw. Students complete chapters or sections (however your content text is arranged) for homework and return with questions of their own in which to begin the next class. Give SACI a try and let us know how usable it is in your PLT’s work with the CCSS. Don’t forget to follow us on Twitter @core4all.